A perfect gift, make someone you love SMILE, or literally laugh out loud! Your Rainbow Unicorn dreams have been answered in this hilarious and awesome LIMITED EDITION professional deck of playing cards by underground playing card legend - De'vo vom Schattenreich with artwork by Brett Gross and box/ad card layout design by Jay Peteranetz. This deck started out as an April Fools joke in 2012, and has since become legend in the playing card world. This special/limited edition has some new coloring to make the rainbow fans stand out, new Box/Ad card, and a new awesome magic trick card! De'vo's playing cards are world famous for both their functional design and their superior handling abilities used by the world's best card experts, Poker Players and magicians! They have appeared on many television shows including Stan Lee's Super Humans television show, most recently on youtube's "Dude Perfect" with over 43 MILLION VIEWS and many other places! De'vo's cards are in the homes of celebrities and Hollywood superstars and used by magicians, card players and card artists around the world. Some of his decks sell out in just minutes after release! All of De'vo's cards are LIMITED EDITION so do NOT miss your opportunity to purchase this amazing deck! This is NOT a cheap novelty deck! This is a WORLD CLASS deck of playing cards printed on the world's best stock with the finest finishes! De'vo has teamed up with United States Playing Card Company, who created the famous "BICYCLE" brand to produce this very special one of a kind deck! This Rainbow Unicorn Deck takes functional design to the NEXT LEVEL by offering many different looks depending on how this deck is manipulated. If you fan normally you will get a RAINBOW! If you reverse fan you will get a nice pink fluffy design. De'vo also designed this deck for magicians to do magic tricks! It can also be an awesome deck to play cards with, a MUST have for all card and Rainbow Unicorn lovers! Rainbows from left to right, pink fluffiess in reverse fans. CUSTOM Court Cards and a hilarious Ace Of Spades! 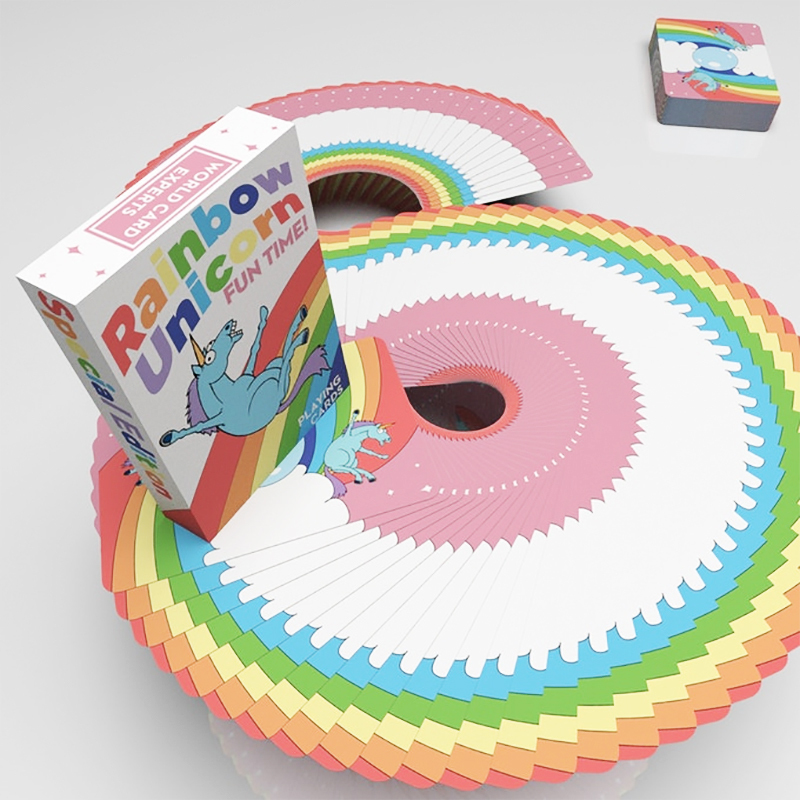 The Special Edition Rainbow Unicorn Deck - there's nothing else in the world quite like this! • The cards are poker size.